Donal Mahoney lives in St, Louis, Missouri. He has had work published in various publications in North America, Europe, Asia and Africa. In 1962, I was a caseworker, not a social worker, in the Cabrini-Green Housing Project in Chicago. In that era, the difference between a caseworker and a social worker was simple. A social worker had a degree or two in social work and was qualified to work with the poor. A caseworker usually had a degree but not in social work. And a caseworker usually had too many clients to have time to do social work even if he or she had a social work degree and knew how to apply it. To be hired by Cook County Department of Public Aid as a caseworker in 1962, all one had to have was a degree in anything and the ability to pass a test. I passed the test and was assigned as a novice caseworker to Cabrini-Green, perhaps the “toughest” housing project in Chicago at that time. I was assigned to two high-rise buildings with 458 families. I remember their addresses as clearly today as the address of my childhood home. Some things one always remembers. I met a proper woman in a proper pub on a Monday in Peoria. It was time for lunch, and we were sitting stool to stool over very large burgers at a long mahogany bar. It curved in and out as if wind-swept and featured high stools with padded seats and backrests, all in a rich faux maroon that complemented the authentic mahogany. The waiter had put us at the bar together, on the last two empty stools, thinking we had arrived there as a couple. Apologizing with his head bowed, he said no tables were available. The place was awash in men who had obviously spent a lot of time in the sun. They were talking agri-business very loud. Plaid shirts and John Deere caps were everywhere. Apparently, the price of pork that day had hit new highs and that event seemed to delight the majority of diners. It was obvious these men knew their pork and probably their corn as well. The odd thing was, not one of them seemed to notice the lady sitting next to me. The price of pork notwithstanding, she deserved a second glance if not a whole lot more. She was certainly no farmer’s daughter. Probably never baked an apple pie. It was easy to see why the waiter thought we were a couple. I was in a Brooks Brothers suit, button-down shirt and a serious rep tie, and the lady was attired in the feminine business equivalent, a conservative suit, albeit in tasteful lavender, and a string of pearls. An hour earlier, we had both landed in Peoria on different planes and found our separate ways to the same restaurant. I was taken by how much she looked like Jackie Kennedy after Dallas but without the pillbox hat. Eventually she spoke. It turned out she was from New York and I was from Chicago and that we were in Peoria for final interviews for jobs we thought we’d get. But living in Peoria, we thought, might not be a fit. We didn’t doubt that Peoria was a nice city, a good place to raise a family even though neither of us was married. But we agreed that adjusting to Peoria might be difficult for urbanites like us, especially at the start, since we wouldn’t be taken with the price of pork, whether it went up or down. >Not too worry, I thought. She is still a very nice looking woman. She paused to see if I’d react to her announcement of her vocation and when I didn’t, she continued. I told her I did not have a wife, nor any candidates lined up in Chicago waiting for my hand. I had met my share of women but I had never met a woman, drunk or sober, who had ever said anything as startling as that even when in the throes of breaking up. I had no idea what to say and so I sat and listened as she continued with my education. I said a procedure like that sounded painful, even allowing for an anesthetic. It sounded much worse, I said, than a colonoscopy, a procedure I’d become acquainted with early in life due to family history. At the end, I added a remark I hoped might prompt a get-together later, perhaps for dinner and drinks, another chat, a little laughter, and who knows what else. If our spirits meshed, a coupling was something we could accomplish before we’d have to take different planes back home. About an hour later, we had paid our tabs, said long good-byes, shaken hands with considerable warmth and headed off in different directions for our interviews. By day’s end, we’d both be flying home to different cities. And although we’d still be strangers, we’d be strangers who had had an interesting conversation. Not interesting enough, however, for either of us to ask the other for a name or number. 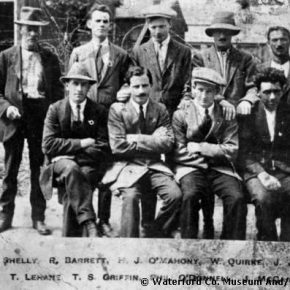 Joseph Francis O’Mahony, first row, third from left, circa 1920, age 16, all dressed up and looking older than 16 as a prisoner of the English on Spike Island a few years before he emigrated to the United States. There he became a citizen and the judge told him to change his name to Mahoney, a decision he would bemoan like a banshee for years. 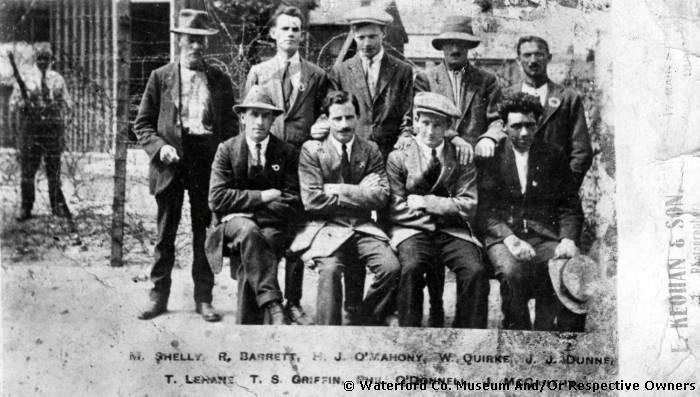 Permission to use this photo has been obtained from the Waterford County Museum in Ireland. In 1920, my father, 16, was a guest of the British government. He was a prisoner of their forces occupying Ireland at the time, a group called the Black and Tans. One day he and seven other prisoners were brought out of their makeshift cells to dig their own graves in a small walled compound. As tradition would have it, they would be shot into their graves and other prisoners would be brought out to bury them. By prearranged signal, the eight men dropped their shovels and broke for the wall. Bullets stopped five of them but the other three climbed over the wall and made it through the rural Irish countryside to freedom. One of the escapees eventually went to Australia, another to Canada. My father made it to America. The story doesn’t end there, of course, and he only told it once. But even if you were only in eighth grade, as I was at the time, it’s not a story you forget. Bill hates to go to parties but he loves to go to wakes. One of the advantages of being old, he says, is that there are fewer parties to go to but a lot more wakes. At parties he finds a distant corner, stands there like a sentinel and watches the young folks have fun. Although he doesn’t approach anyone to start a conversation, Bill’s not upset when people approach him. Some young folks want to know why is the old guy standing in the corner. And he doesn’t hesitate to tell them. At parties Bill and his wife always slow dance at least once even though he says he has two left feet. He says that after 50 years of marriage, his wife’s used to having her feet under his. He says she never complains. She loves parties and is happy that he’s willing to come along, even if it’s only to stand in a corner. At wakes, however, Bill comes out of his shell. He’s in his element at wakes. His modus operandi at a wake isn’t complex. First he consoles the bereaved and then talks to anyone and everyone who has come to the wake. When Bill has finished his rounds, everyone, even the dead person’s kin, feel a little better. “Bill should have been an undertaker,” his wife says, coming back from the dance floor. Bill says he would have been an undertaker but in most states you have to be an embalmer to qualify as an undertaker. Several years ago, a friend of Bill’s lost his wife and Bill, of course, went to the wake. Bill and the widower were shocked, but later the widower dated the woman and married her. In a relatively short time, she spent most of his money and then divorced him when he got sick. He died a year later very much alone. Had Bill known his friend was sick, he would have tried to supply him with support. He has great empathy for the dying as well as for those mourning the dead. Going to wakes reminds Bill that some day he will be the guest of honor at his own wake. He has mixed feelings about that. He thinks it’s selfish to want to die first but that is his wish. He doesn’t want to live without his wife by his side. Thirty years ago, long before ISIS started executing Kurds, Muslims and Christians, I hired a Pakistani Muslim as an art director in Chicago. I was an Irish Catholic editor putting out a small national magazine. I hired him because his work samples were good and he had worked for the United States embassy in Pakistan for more than a decade. The embassy facilitated his emigration to America. It didn’t hurt that he had seven children and I had five. I too knew the misery of being out of work with a family. Different as we were, Mohammed and I were also much alike. Deadlines and details were important to both of us. Other than the two of us, the staff was female. It helped on occasion to have another man around the office. It will be a while before Fred’s hometown has its annual food drive, he told me. That’s an important event because it helps stock the pantry at the small charity where he volunteers. Right now, he said, the larder is practically bare and unemployment is still a big factor in the lives of many where he lives. Certain times of the year are worse than others, he said, and this is one of those times. It’s not that people who have money aren’t willing to help others but they have bills and needs of their own. It’s easy sometimes to put those in need out of mind, at least temporarily. Fred’s charity helps people who wouldn’t come through the door if they didn’t have to. They may be broke but they still have pride and that’s a good thing because when a job opens up they’re ready to apply.